After years of planning, it was 1921 when Lazarre Bisson realized his dream and began tapping his maple trees on the southern mid slopes of Cates Hill. He built his small and primitive sugar house a few hundred yards up the road from the existing sugar house. 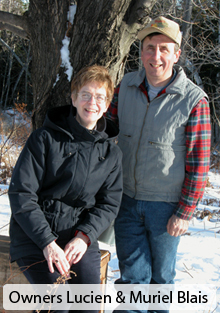 The sugaring business complimented his farm operation on the top of Cates Hill since the Springtime was normally a slower time of the year on the farm. With the help of his nephew, Armand Bisson, Lazarre managed his surgaring business for 15 years. The work was hard and all done by hand and horses. Sugar parties were often held at the sugar cabin. The varied maple products were also sold on the premises and distributed in area neighborhood stores. The familiar maple "taffy" was sold in tin cups. Lazarre past away in 1936 and the business began to be managed by Armand and his wife Juliette. The operation has grown and change over the years. In the late 1940's horses used to gather sap were replaced by a tractor. This made it possible to haul three 125 gallon tanks rather than just one. In 1953 the present sugar house was constructed making the entire operation more efficient. It has been considered by many in the business to be a model design. In 1979, the conversion from buckets to tubing began and today all 3000 taps have tubing and vacuum as a means of collecting the sap. The old tractor, along with a 1954 Farmall Super H, are used to gather the 20 to so cords of wood consumed during the five week season. The wood burning arch in use since 1953 has been replaced by a more efficient wood burning forced draft arch. New stainless steel pans were installed in 1991. A "Steam Away" has been added on top of the 5 x 10 flue pan which utilizes the generated steam to begin the evaporation of the sap, which makes possible the evaporation of over 300 gallons of sap per hour. A smaller wood fired evaporator is used to make our popular maple taffy, butter and old fashioned candies. All of our products are pure with nothing added. 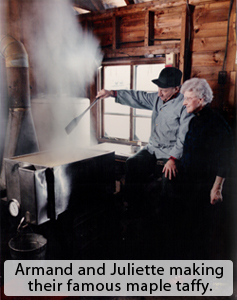 In the 1970's, Armand and Juliette's niece Muriel, and her husband Lucien Blais began to help out in the business. Just as Armand had learned the art of sugaring from his uncle, Muriel and Lucien in turn began to learn the process from Armand and Juliette. In 1988 management was passed on to Lucien and Muriel. Juliette passed away in 1990 and Armand in 2004. In January of 1998 a devastating ice storm lasting three days ravaged the higher elevations of Maine, New Hampshire, New York and eastern Quebec. Bisson's sugar bush was hard hit killing or severely injuring many of our trees. We decided to continue by leasing sugar maple trees from two other locations. The sap is hauled by truck from two miles away. Our story is one of tradition and survival. Every Spring the steam still bellows out from the sugarhouse cupola and maple products continue to be made as they were nearly a century ago. For many, the Springtime trek up the hill has become a family tradition. We enjoy continuing and sharing a part of Berlin's rich heritage.